“A library outranks any other one thing a community can do to benefit its people. It is a never failing spring in the desert.” Andrew Carnegie saw libraries as places that respond to the needs of local people, giving the opportunity to live fuller lives, discover new worlds and aspire to greater things. The Engaging Libraries programme, a partnership between the Carnegie UK Trust and the Wellcome Trust, encouraged libraries to be a space where people could explore, connect and think critically about health and wellbeing – discovering the new worlds Carnegie envisaged and moving beyond health information to public engagement on health and wellbeing. We learnt a lot from the programme. First, that as safe and trusted spaces at the heart of their communities, public libraries are well suited to acting as a space for discussion and debate about ‘tricky subjects,’ such as death and body image. This has huge potential. Second, that through the programme, libraries demonstrated that they are open to experimenting in creative ways to engage their users on these subjects. For example, death cafés, teddy bear picnics and science ceilidhs proved accessible and exciting ways to get into challenging topics. Thirdly, public libraries demonstrated once more their ability to work in diverse partnerships across different sectors and disciplines to deliver their projects. The library services involved forged partnerships with authors, scientists, arts organisations and academics, to name just a few, and some of the partnerships made through Engaging Libraries have led to future projects for library services. The delivery of the programme saw public libraries win local awards, secure additional funding for their projects and see their outputs embedded in mainstream local authority activities. 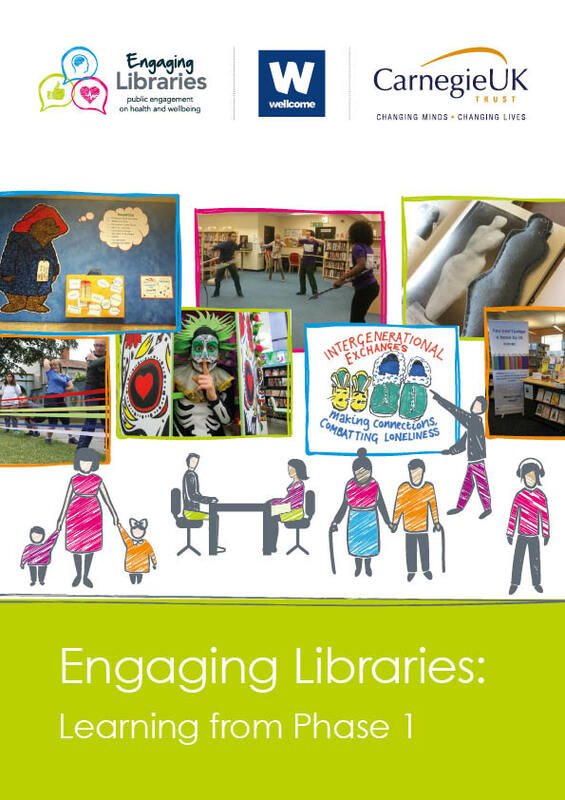 Learning and reflections from the 14 projects across 16 library services are detailed in a new report we’ve published this week: Engaging Libraries: Learning from Phase 1. We are delighted to announce that there will be a new round of the Engaging Libraries funding programme for UK libraries, which will open for applications later this year. The programme will build on phase 1 and will be a partnership between Carnegie UK Trust, Wellcome, and the Wolfson Foundation. The second phase of Engaging Libraries will support public libraries across the UK to deliver public engagement projects with research in health, culture and society, and to foster partnerships between public libraries and researchers. The new programme will help libraries them to further demonstrate their impressive offer, not only to communities they serve but also to a wide range of funders and potential partners whose goals overlap with public libraries. Whilst there are some changes between the first and second phase of the programme, we hope that Engaging Libraries: Learning from Phase 1 inspires library services, and encourages conversations about potential activities or with potential partners. We will publish information about Engaging Libraries phase 2 on our website – so please watch this space. We look forward to seeing exciting, engaging applications in our next phase!